What’s up fellow motorcycle enthusiasts! Welcome to my custom bobber build blog. This is my first build so if you see some mistakes in the process feel free to comment fast before I screw something up! After deciding to build a bike (thanks to Orange County Choppers and Biker Build Off). I did a little research as to what bike to build. I loved the look of the shovel head, knuckle and pan head motors but after doing the math I decided to go a cheaper route. 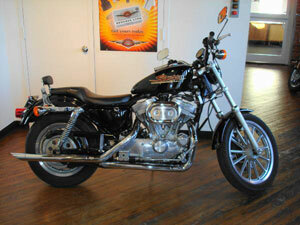 A Harley Davidson Sportster engine is affordable and comes with a FREE TRANSMISSION ;). The best way to build an affordable custom bike is to chop up a donor bike. I already had a Suzuki Blvd M50, the bike that got me hooked on motorcycles. It was only a couple years old so I took it to a Harley dealer and traded it for a 2001 Sportster 883. After having some fun riding the Sporty around I decided it was time to do some engine work. Some research on the web pointed me to to a company called Nallin Racing Head Service. After speaking to Dan (real nice guy) and telling him what I’d like to do and my budget I ordered my go fast goods!